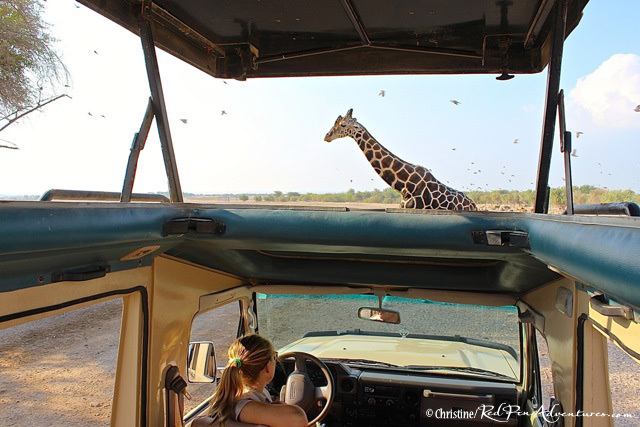 A beautiful giraffe crossing in front of the game viewer vehicle during our safari! 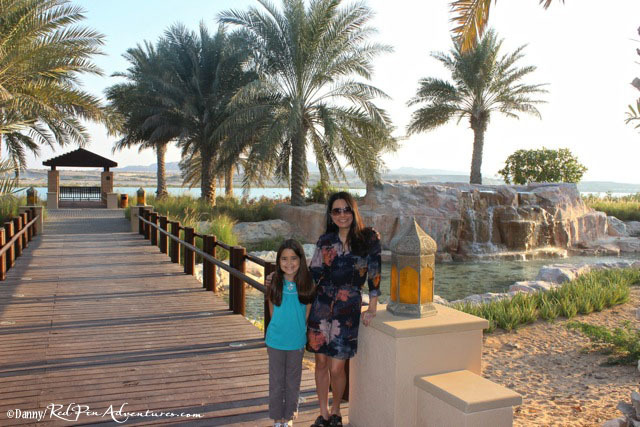 My family and I recently visited this stunning island which is located only about a 2.5 hour drive from the Abu Dhabi International Airport. The island is accessed by a quick 15 minute ferry ride across the tranquil turquoise sea of the Arabian Gulf. The island has its own airport with accessible flights from both Abu Dhabi and Dubai. For the more adventurous, there is also a seaplane that you can charter for a more unique arrival. There are three Anantara Eco-Friendly Resorts to choose from on the island. The main resort is Desert Islands, which is located on the coast. 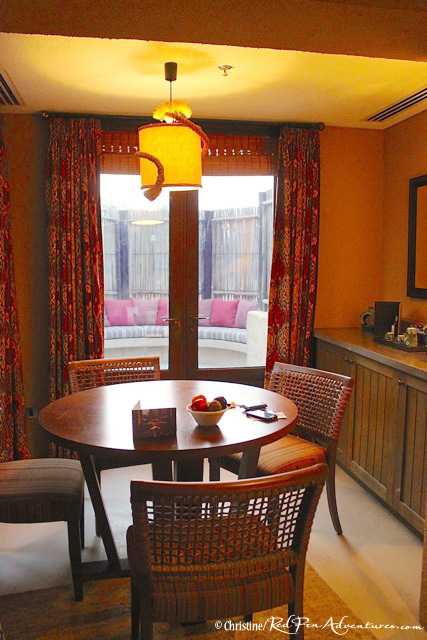 The second is Al Yamm which is also located on the coast with 30 luxury beachfront and lagoon villas. 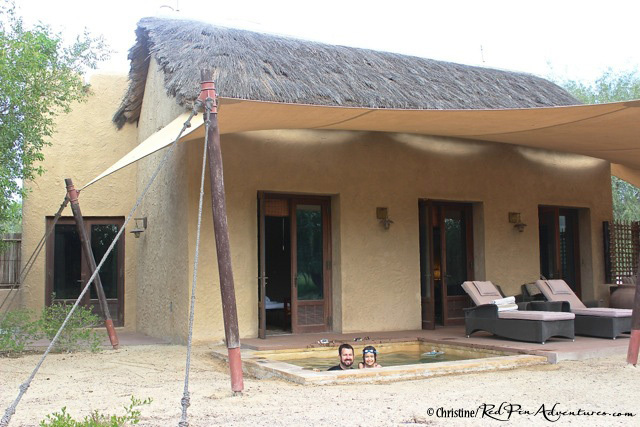 The third resort, the Al Sahel Villas is the one my family and I stayed and was definitely our favorite. 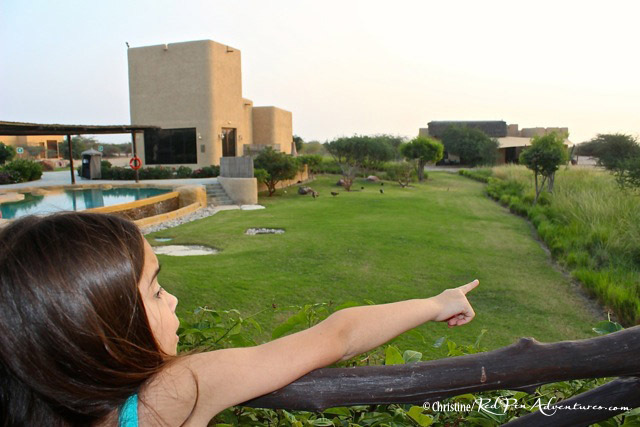 Your villa is nestled amongst the Arabian Wildlife Park and free-roaming animals can be seen all around the property. There are numerous adventurous activities to choose from. Our first morning we did the safari drive, which I highly recommend. 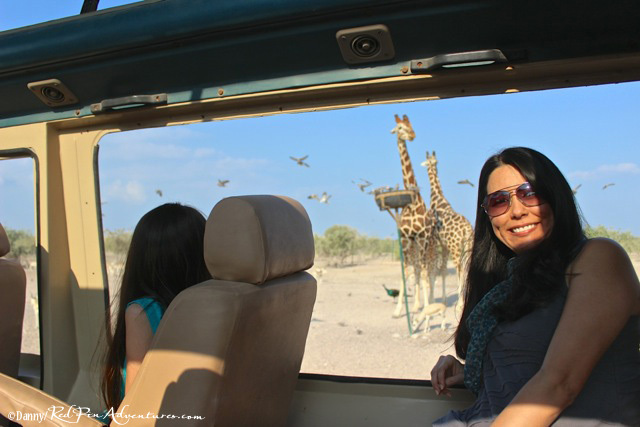 As we boarded our Land Cruiser Game Viewer, it was hard to believe we were in Abu Dhabi and not Africa. 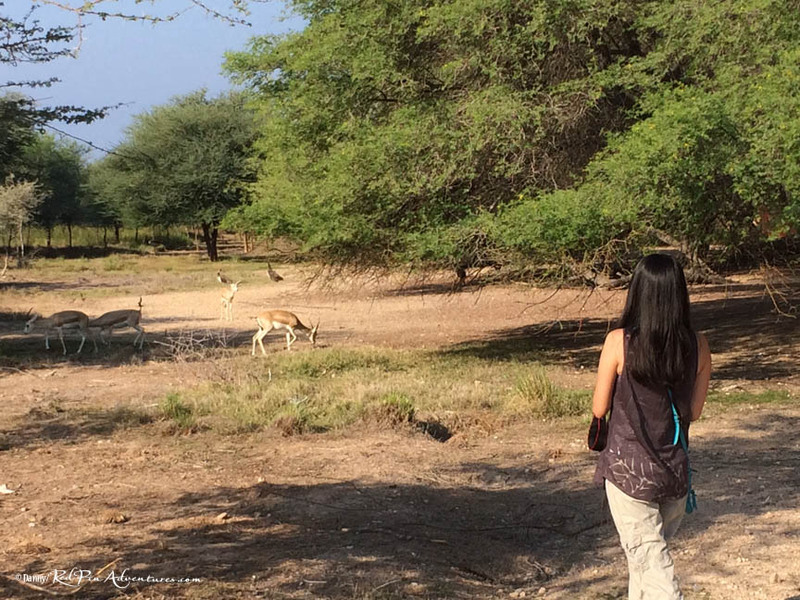 We saw numerous animals including gazelles, deer, giraffes, and even cheetahs. 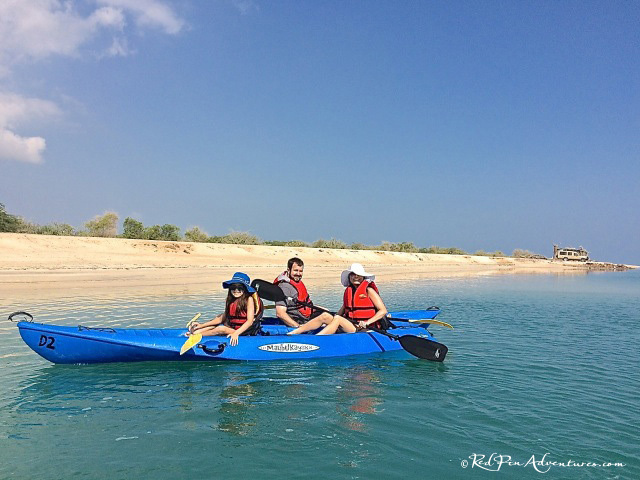 We also took a kayaking trip through the mangroves which was very peaceful. We even managed to spot some sting rays and flamingos. Our guides on both activities were extremely informative and friendly. Activities book up during peak times, so I would recommend making reservations in advance. The dining options were another highlight of our trip. 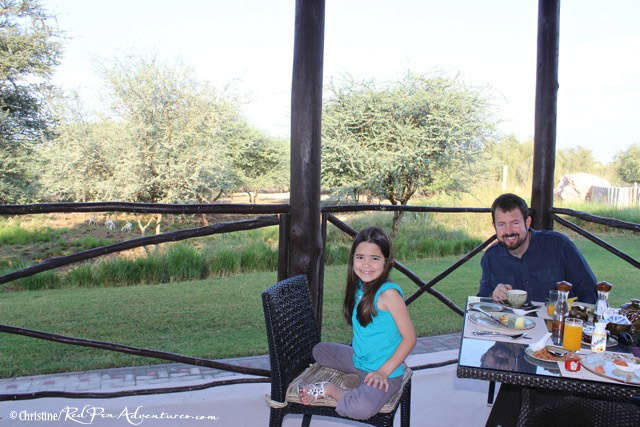 Each morning, we ate at the Savannah Grill at Al Sahel. 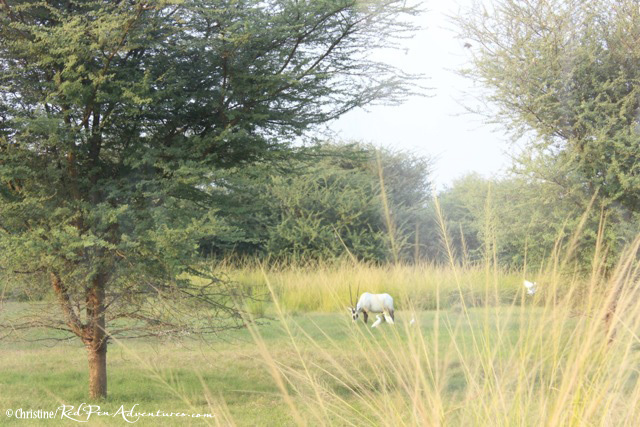 Although the pictures and videos don’t quite do it justice, I’ve tried to show just how amazing it was each morning having breakfast right next to the amazing wildlife. We also took the opportunity to eat at Amwaj at Desert Islands. Located beachside, this seafood restaurant did not disappoint. For our last dinner, we did the Boma BBQ at Al Sahel. With a bonfire and traditional African dishes, it was a memorable family dinner under the stars. 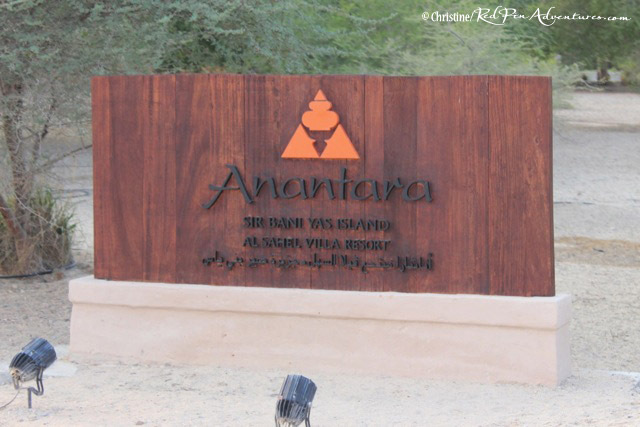 This is our second visit to an Anantara resort. The first being Qasr Al Sarab (which I’ll write about next). Both of which have made it onto our Top Adventures List and have an exceptionally friendly staff and perfect serene settings for a unique and relaxing holiday. 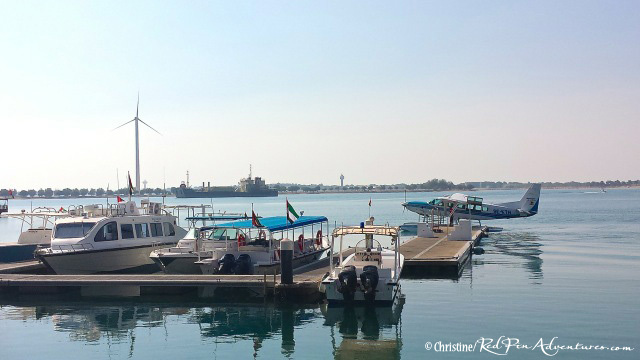 The boats and a seaplane at the dock where you arrive on Sir Bani Yas Island. 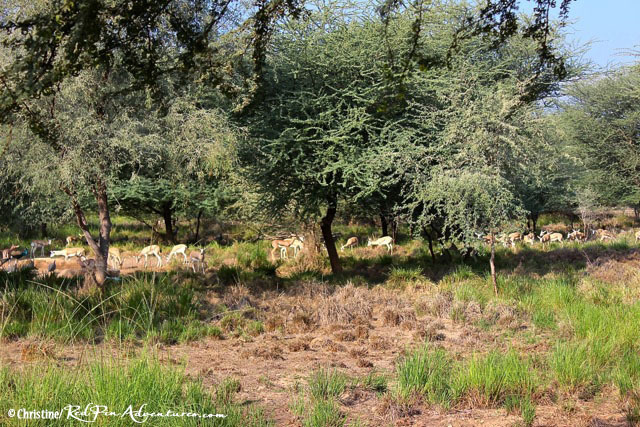 A beautiful Arabian Oryx we spotted on the drive to the Al Sahel Resort. 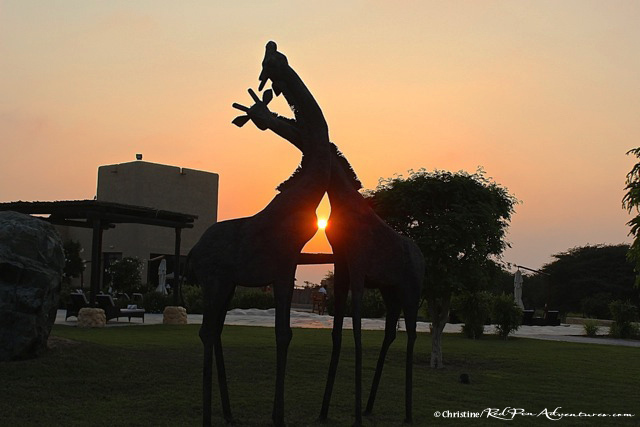 Sunset at the giraffe sculptures which greet you at the reception entrance to the Al Sahel Resort. This is Mia when we first arrived at the resort. She couldn’t believe her eyes and was pointing at everything! Danny and Mia having fun in front of the game viewer vehicle which we rode in for our safari and to our kayaking adventure. 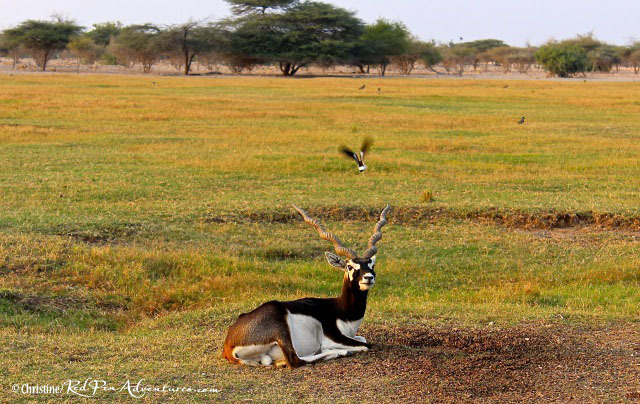 A stunning Blackbuck/Indian Antelope on the island. 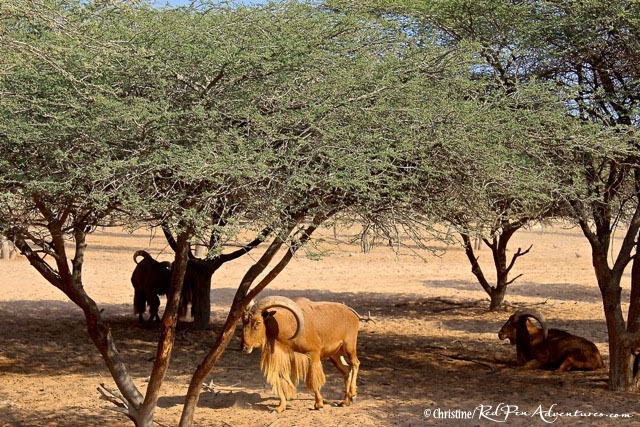 The impressive large curled horns of the Barbary Sheep on the island. 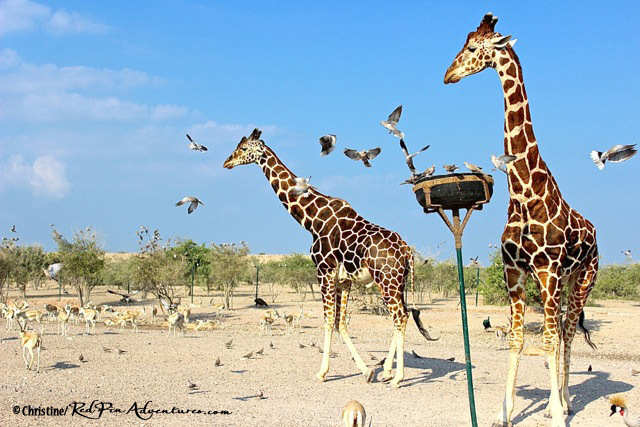 Two stunning Reticulated Giraffes with the gazelles and birds on our safari. Mia and I in the game viewer vehicle with a view of the beautiful giraffe. 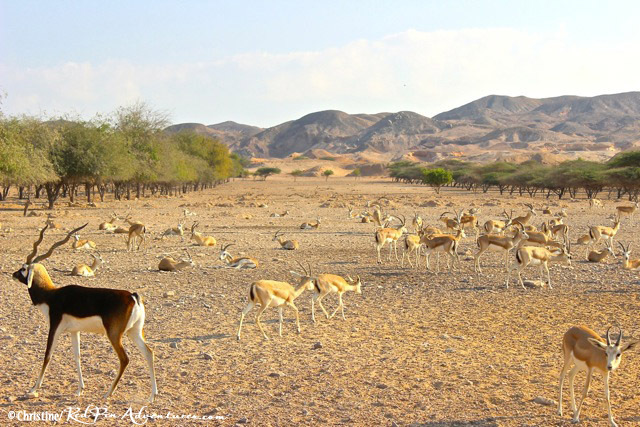 Sand Gazelles and an Indian Antelope in front of the beautiful salt domed hilltops on our safari. Two beautiful deer on our safari. We spotted many deer on the island. A stunning male Axis/Indian Spotted deer on our safari. 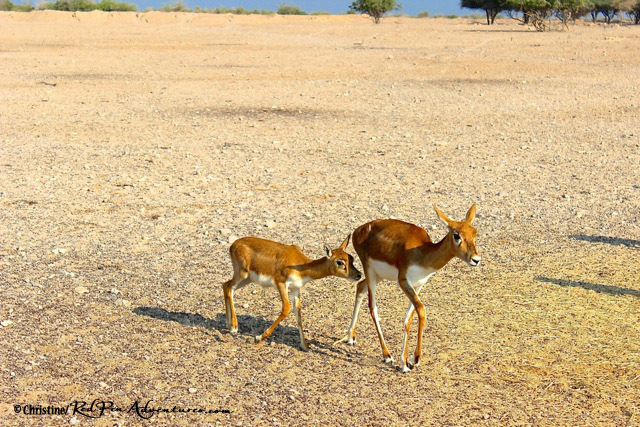 Beautiful sand gazelles on our safari. I loved the one who looks so proud in the center. 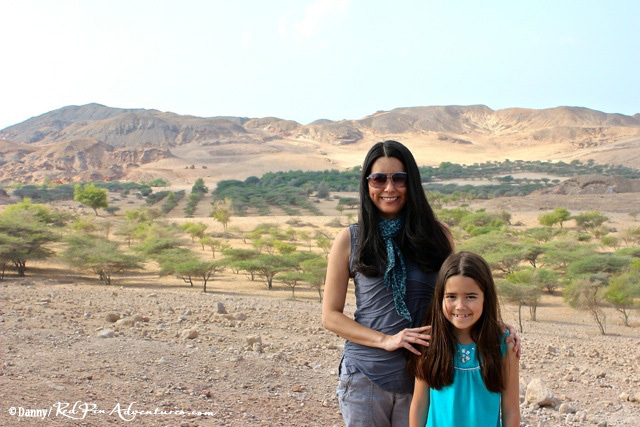 Mia and I in front of the beautiful landscape at a stop on our safari. 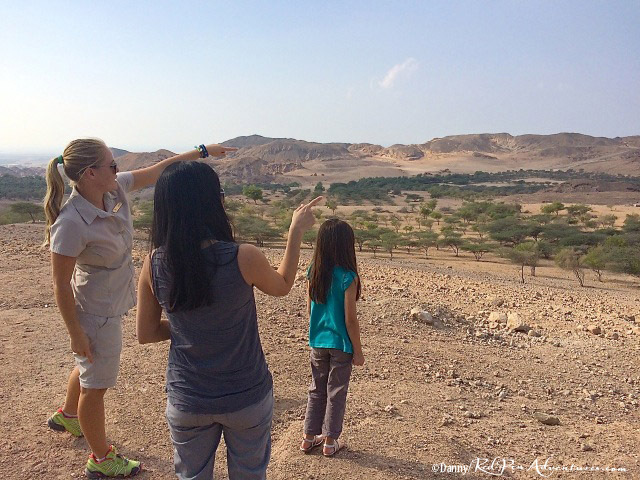 Our guide, Marie pointing out the olive trees and the stunning landscape on our safari adventure. I really enjoyed the safari experience on the island. 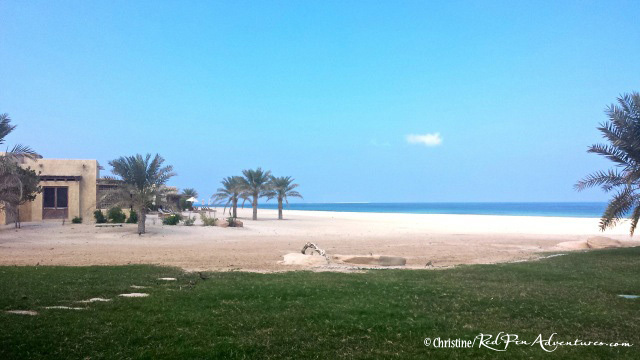 The lovely beach/villa area at the Al Yamm Villa Resort. 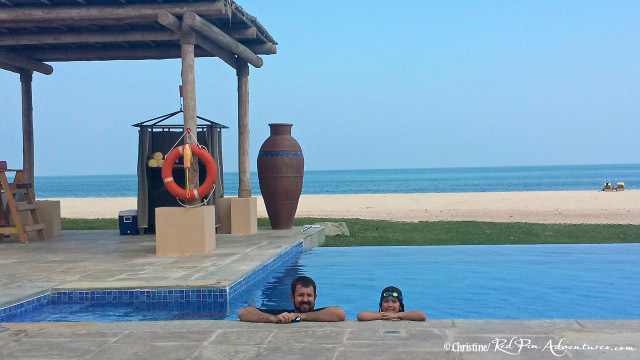 Mia and her daddy having fun at the stunning infinity pool at the Al Yamm Resort. Our family at a sandbar getting ready to explore the mangroves on the island. 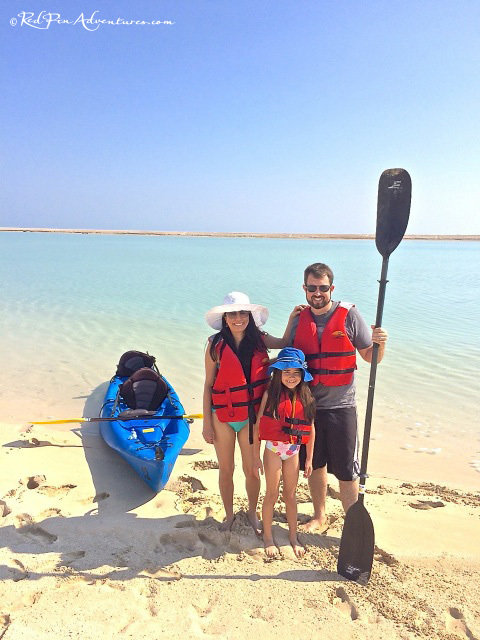 My family and I on our sea/mangroves kayaking adventure on the island. Our very informative guide Matt, took this photo for us. 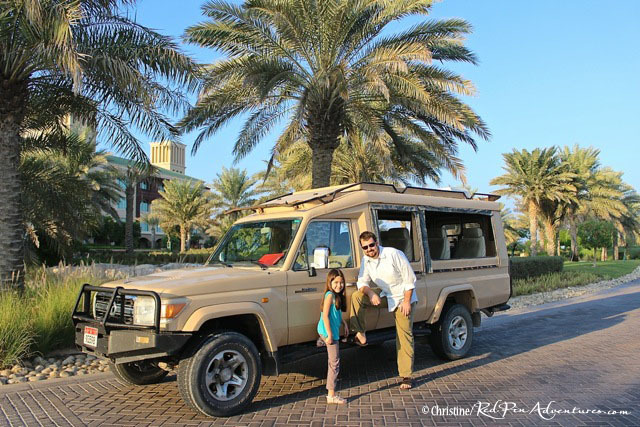 Mia and I at the beautiful entrance to the Desert Islands Resort. 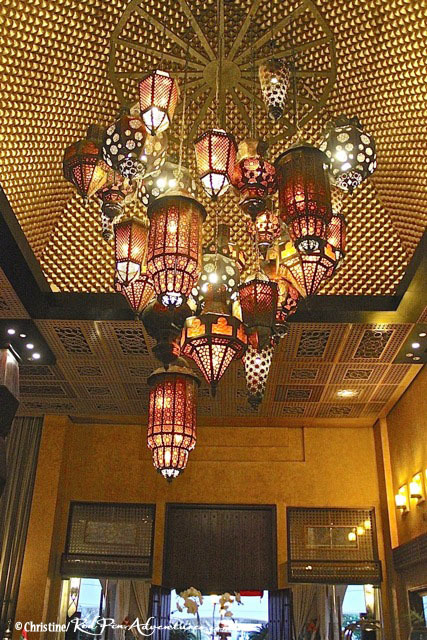 The breathtaking lanterns at the lobby of the Desert Islands Resort. The entrance sign to the Al Sahel Villa Resort. 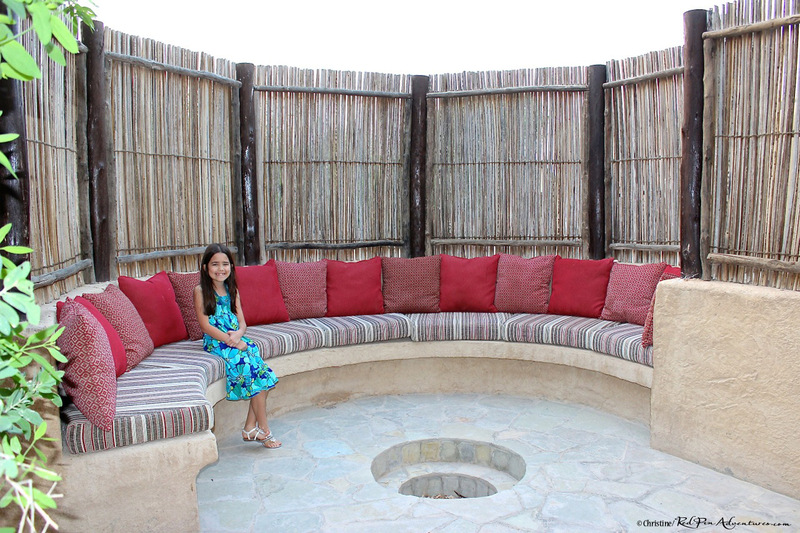 Mia having fun at the back of our villa at the Al Sahel Resort. 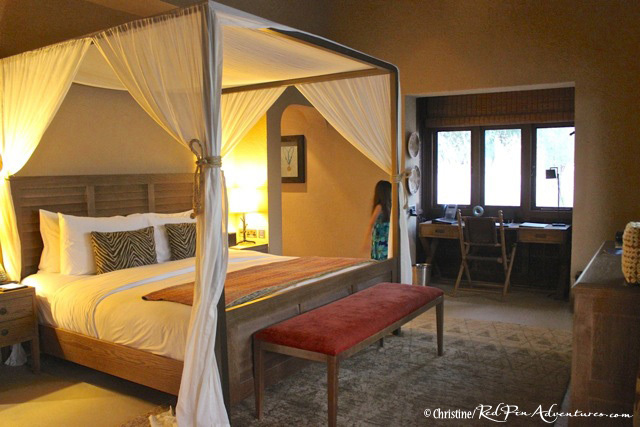 The relaxing bedroom/desk area of our villa. It was perfect weather to enjoy all of the back doors and windows open for a nice view of all of the animals and a relaxing breeze. 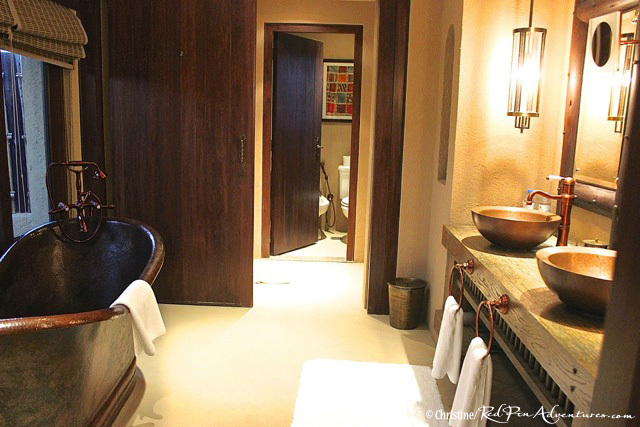 The lovely bathroom area of our villa. 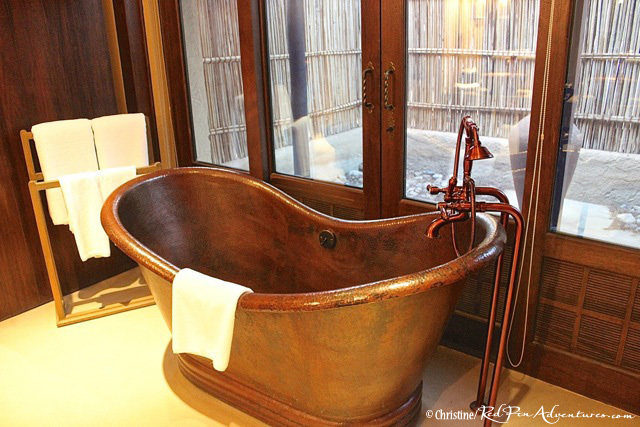 The beautiful copper tub and front garden area at our villa. The dining area at our villa. Mia at the fire pit area at our villa. The back porch area of our villa at the Al Sahel Resort. 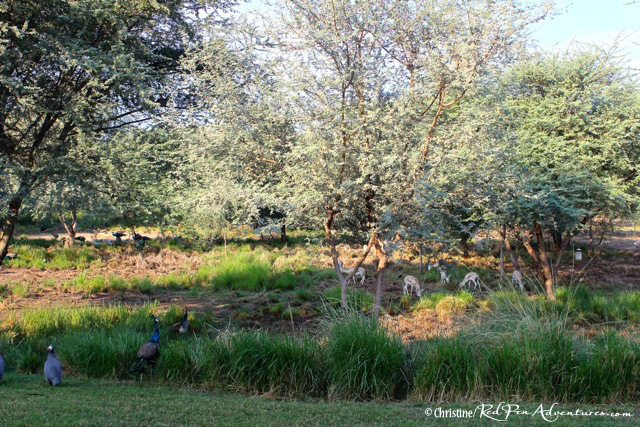 The back view of our villa where we enjoyed watching the many free-roaming animals every day. Mia and Danny having fun in the pool at our villa. I was relaxing on the back porch of our villa and couldn’t believe how close this beautiful sand gazelle came up to me! What an amazing experience!! 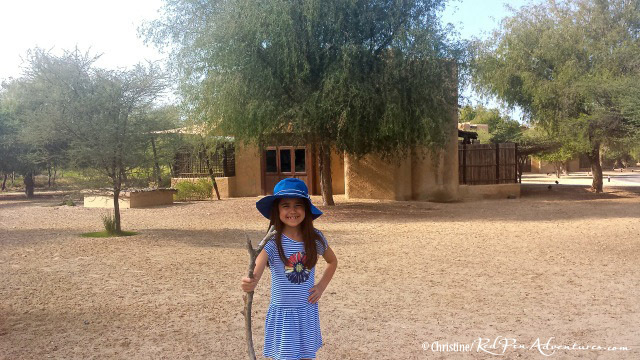 Mia found this cool walking stick at the Al Sahel Resort. This is a side view of the villa. 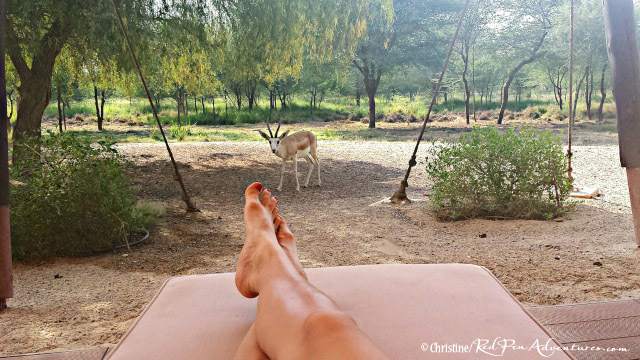 Danny took this photo of me taking photos of the animals at the Al Sahel Resort. So peaceful! 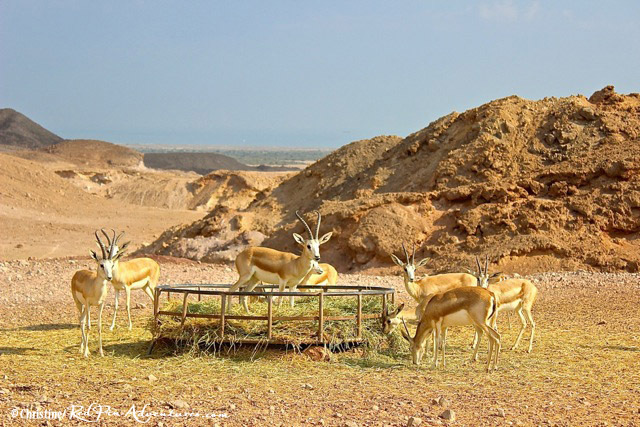 The breathtaking view of the animals from the breakfast at the Savannah Grill at the Al Sahel Resort. 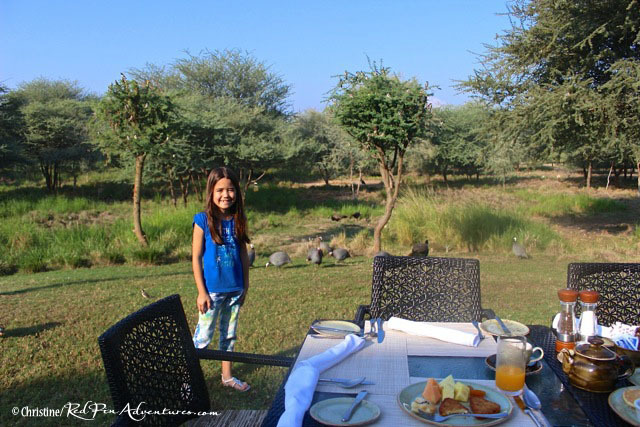 Mia really enjoyed the breakfast every morning with the animals at the Al Sahel Resort. These beautiful birds loved to hang out by our table every morning for breakfast. Mia and Danny having fun at the breakfast which had an unbelievable view of many animals every morning. 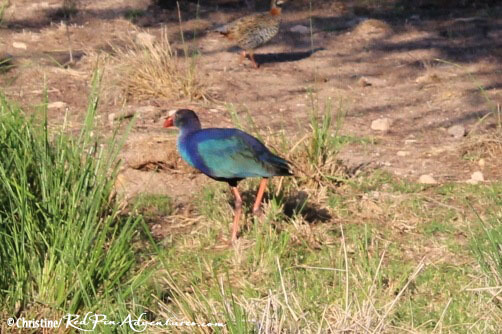 I believe this beautiful bird is a Takahe. 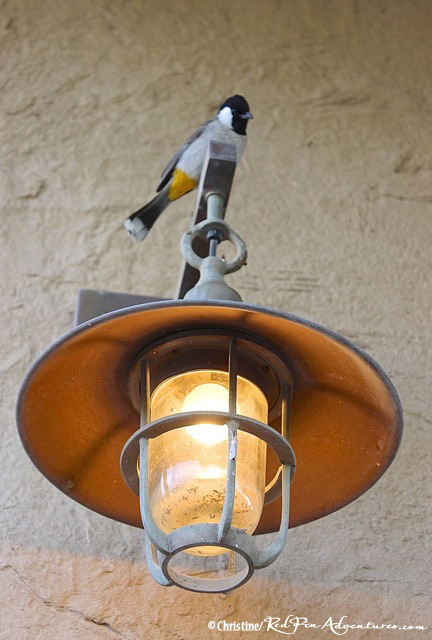 It was one of the many birds who you will see at the breakfast at the Savannah Grill Restaurant. 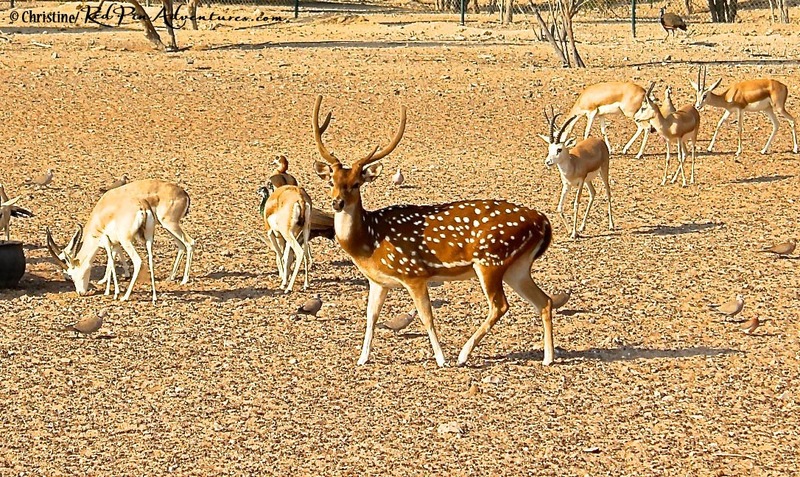 A large group of gazelles at the Al Sahel Resort. 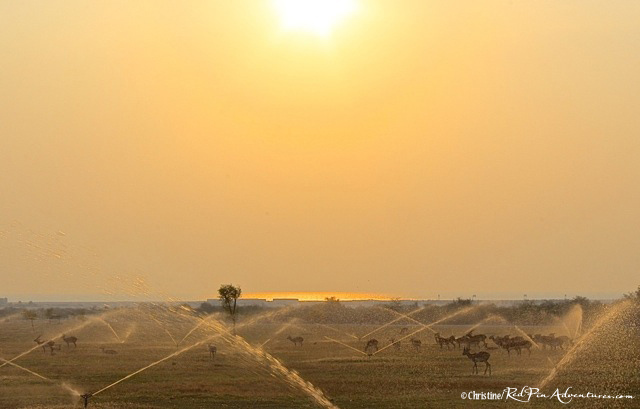 Gazelles having some fun in the sprinklers before sunset on the island. 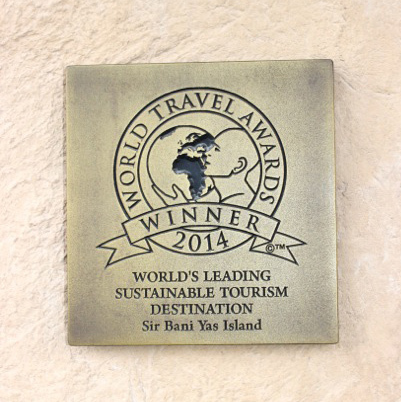 This award for the World’s Leading Sustainable Tourism Destination was displayed at the entrance to the Al Sahel Resort. 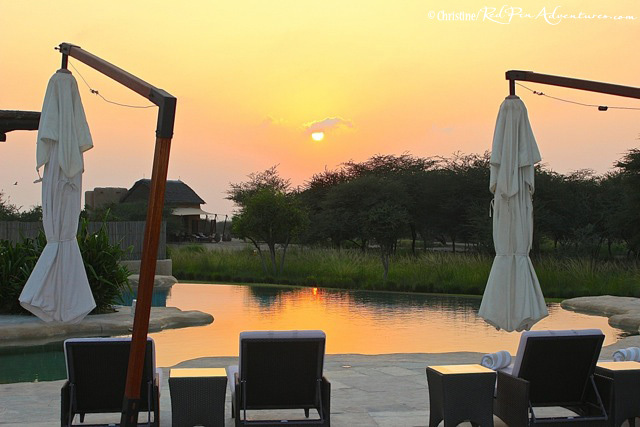 A great way to end the day… A stunning sunset at the Al Sahel Resort pool. 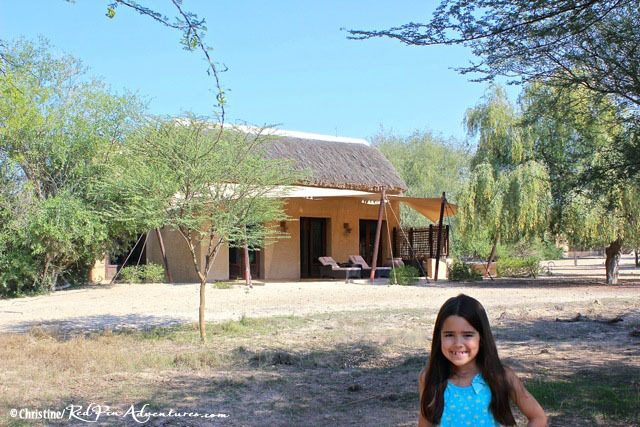 This entry was posted in Adventure, Expat Life, Nature, Photography, Travel, Uncategorized and tagged Abu Dhabi, Anantara, Family Vacations, Red Pin Adventures, Safari, Sir Bani Yas, UAE. Bookmark the permalink. Amazing pictures. Thank you for sharing. Now that’s what I call a vacation. Incredible! Looks fabulous. Yes, it was an amazing experience! Hope you can make it to the island one day to see it yourself! Thanks for stopping by! 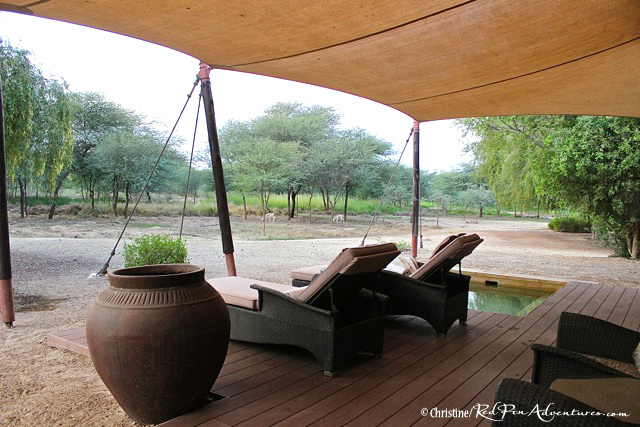 We were fortunate enough to stay on Sir Bani Yas three or four times while I was working in Abu Dhabi (and have posted quite a few of my photos on my photography blog). A very special place. You were lucky to get the chance to stay there so many times! It is certainly a very special place. After four days there, my family and I were ready to move in! 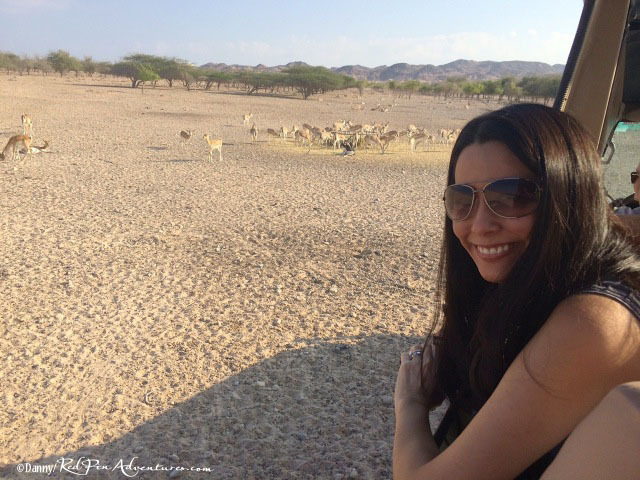 A real African safari, in the desert. How wonderful.